Lady Marshal seniors (L-R) Aubree Jo Kemp, Kylee Meeks and McKenzie Tack. 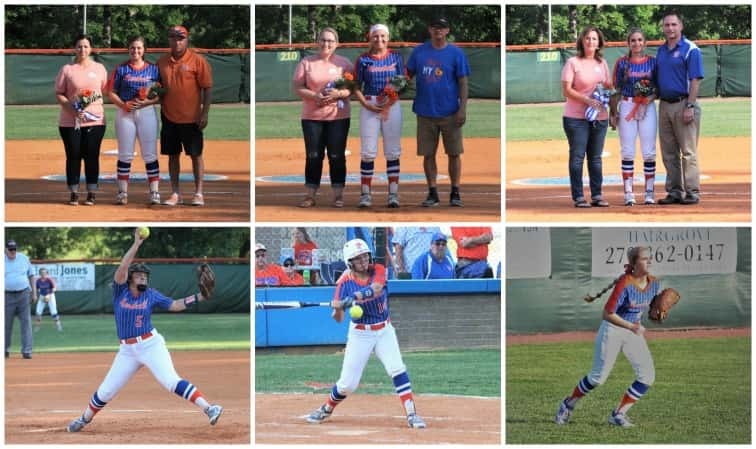 The Lady Marshals celebrated Senior Night Monday with a 10-3 win over Lyon County. Seniors are Kylee Meeks, Aubree Jo Kemp and McKenzie Tack. The team also recognized Abbie Swoope, who would have been a member of this senior class. Kylee is the daughter of Chris and Heather Meeks and she plans to attend college. Her teammates said she has helped them all build a stronger relationship with God and has been a great role model. Always in the dugout cheering everyone on with a positive attitude. McKenzie is the daughter of Brad and Lisa Tack and plans to attend the University of Kentucky. Her teammates said she is always cheering them on even when she couldn’t play earlier this season and has been a great leader, role model, and friend for of them on and off the field. Aubree Jo is the daughter of Jerry and Laura Kemp and plans to play softball for Southern Illinois College. Her teammates said Aubree has really stepped up for them this season and has played a strong role on the field, always willing to help them and cheer them on when she is in the dugout. The seniors joined Annie and Tyler Swoope on the field in recognition of their daughter Abbie. Abbie’s parents are Tyler and Annie Swoope and sister Zoie is a member of the Lady Marshals. Abbie enjoyed playing softball for her team the explosion. She earned the nickname Arnold by her coaches because of her strong bat and tenacious defense. She cherished every friendship she made with teammates and coaches and would simply love this team today. 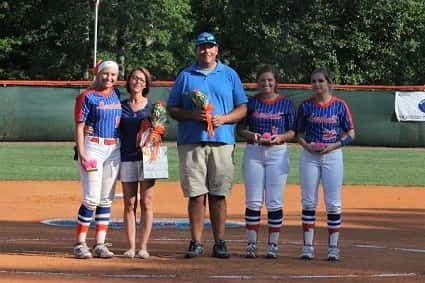 The Senior Night win began with a 3-run first inning for the Lady Marshals, scoring coming on a ground out RBI by Riley Piercefield and 2-run single by Cayson Conner. Lyon County tied the game with a 3- run third inning before the Lady Marshals scored five runs in the fifth to go up 8-3. They scored on a sacrifice by Gracey Murt, single by Piercefield, sacrifice by Zoie Swoope and 2-run triple by Sarenna Tomassi. Murt sealed it with a 2-run home run in the sixth inning for the 10-3 win on 10 hits. Gabbi Lovett earned the win in five innings on the mound, allowing four hits, three runs and struck out two.